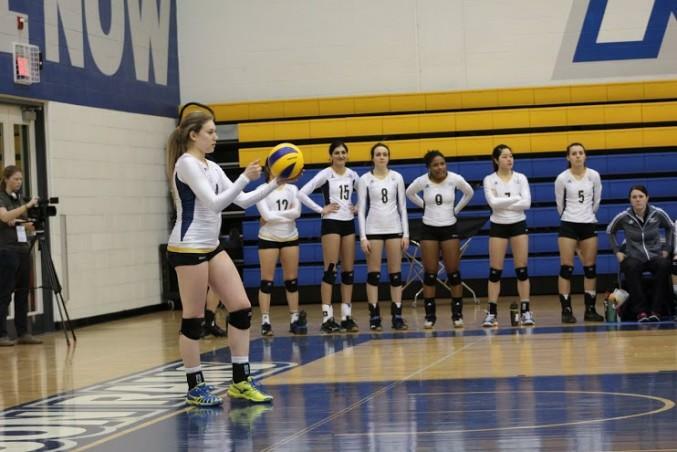 It had been 67 days since the Rams women’s volleyball team had played in front of their home crowd. The wait paid off in resounding fashion, as the Rams (12-4) dominated the Nipissing Lakers (5-11) from start to finish, winning by a final score of 3-0 (25-20, 25-20, 25-16). Jena Bonello led the way with 16 points, including 12 kills. Livingston had 11 kills and 13 points while Emily Nicholishen had 10 kills and 11 points. The defensive end was held down by the tough Rams libero Julie Longman, whose 14 digs were the most of any player in the game. The win puts the Rams, for the moment, in a two-way tie for second place with Ottawa in the Ontario University Athletics East division. With just three regular season games remaining for the Rams, head coach Dustin Reid sees dominant performances like these as big steps forward. “We want to start building in a positive direction, so we wanted to take that first step today and I was happy with how we played,” said Reid. Ryerson’s serving game tonight may have been the biggest story. After a service error near the end of the first set, the Rams went the entire second set and a large portion of the third without committing another fault. They finished the day with just two. “[Serving] is certainly an important part of our game, and it’s something that when you’re playing at home again the players are much more comfortable,” Reid said. The Rams will look to push forward with another win Saturday as they take on the York Lions (9-7). The game starts at 6 p.m. at the Mattamy Athletic Centre.